JODHPUR, INDIA - 15 FEBRUARY 2015: Groom coming out to wedding procession at street in Jodhpur. Newlyweds kissing in the palats. Wedding prince and princess. Bride and groom in the palace. Bride and groom look at each other. 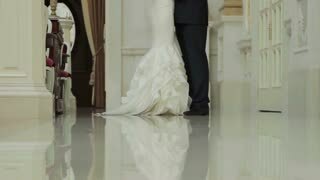 Beautiful wedding of lovers.